Carbon Dioxide is a colourless, odourless gas and there’s very little of it in the Earth’s atmosphere (only about 0.04% by volume) but wow does it have a big effect on every living thing on this planet. Without it none of us would be here! Plants, algae and cyanobacteria mop up CO₂ in an incredible process called photosynthesis – a complex chemical reaction using light energy to convert CO₂ and water into Oxygen (O₂) and carbohydrate. Carbon-based molecules are crucial for life on Earth, because they are the main component of biological compounds ie living organisms. 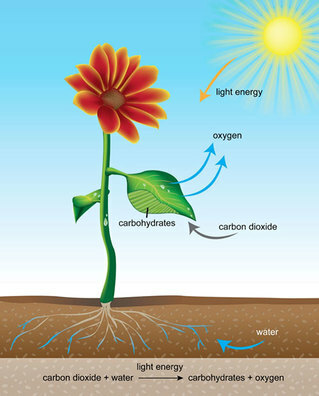 Atmospheric carbon dioxide is the primary source of carbon for life on Earth. 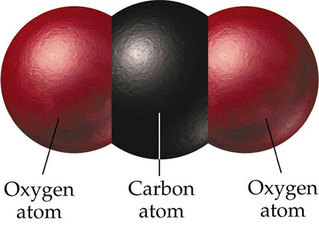 Carbon dioxide molecule (image: Glogster). Emissions from volcanoes, hot springs and geysers. Combustion of wood, carbohydrates and major carbon and hydrocarbon rich fossil fuels such as coal, peat, petroleum and natural gas. The release and capture of CO₂ is a complex process called the Carbon cycle where CO₂ flows through all the processes mentioned above. Over the last 3 million or so years the CO₂ level in our atmosphere has been relatively constant, but since the start of the industrial revolution approximately 200 years ago, the equilibrium of the Carbon cycle has started to change. While fossil-fuel derived CO₂ is a very small component of the global carbon cycle, the extra CO₂ is cumulative because the natural carbon exchange cannot absorb all the additional CO₂. CO₂ levels in our atmosphere have increased dramatically in this time period due to the effect of human created emissions and this is now affecting many parts of our world. ​The level of atmospheric CO₂ is building up, and that build up is accelerating. It is now important for all of us to understand the relevance of our individual actions and how we can make decisions to help reverse the trend. This will not be easy but every little helps.